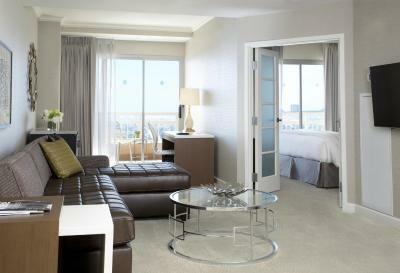 Lock in a great price for InterContinental Los Angeles Century City at Beverly Hills – rated 8.7 by recent guests! The lady we checked in with was super sweet and accommodating and fast! Excellent customer service!! Loved how the hotel smelled of fresh roses and everyone was so nice. I even mentioned my husband and I were celebrating our anniversary and birthday and when we got back from dinner they had a bottle of champagne and a small cake for us to celebrate!! And the cake tasted amazing!! We were so surprised!! Loved it so much since it was exactly what we needed after we got back from dinner. The bed felt like a cloud and I loved how there was a ihome speaker with wireless charger. I actually forgot my charger and didn’t expect for the room to have that feature. We also had an upgrade when we checked in because they knew of our celebration. And they even gave us a ride to our dinner reservation in a Tesla!! It was pretty cool!! I give this hotel 100 stars!! The staff was amazing!! so kind and helpful, best service! Clean, attentive staff, comfortable beds. Internet is fast. I am pleased having shattaf in bathrooms which made my stay comfortable. Location was perfect for my needs. Public spaces were nice and the staff was genuine. Car service was great. Front desk was helpful when asking recommendations to eat. Room was great, bed extremely comfortable. The staff were courteous and friendly; the hotel was immaculate; breakfast and wait staff were delightful; and the room was cleaned to perfection. Small things like getting shoes shined in an emergency were wonderful. I'll be back to visit again with my family. InterContinental Los Angeles Century City at Beverly Hills This rating is a reflection of how the property compares to the industry standard when it comes to price, facilities and services available. It's based on a self-evaluation by the property. Use this rating to help choose your stay! One of our top picks in Los Angeles.Boasting an outdoor infinity pool, this hotel is a short walk from 20th Century Fox Studios and is less than 1.5 mi from Rodeo Drive. 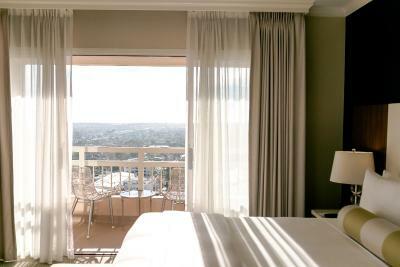 All spacious rooms offer a private terrace with city views. On-site parking offers in and out privileges. InterContinental Los Angeles Century City rooms include a flat-screen TV, mini-bar, and bathrobes. The contemporary rooms are equipped with a work desk and newspapers are delivered daily. Hotel guests can work out in the gym or relax in the hot tub. The Los Angeles InterContinental also offers a concierge. The Mari Los Angeles serves regional and international cuisine as well as an extensive cocktail list. 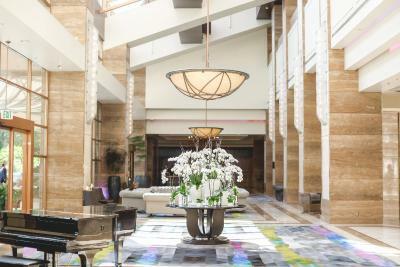 The Intercontinental is less than 10 minutes' walk from Westfield Century City shopping center. Getty Center and Santa Monica beaches are about 6 mi away. 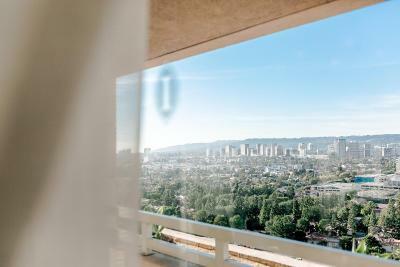 Century City is a great choice for travelers interested in shopping, restaurants and food. 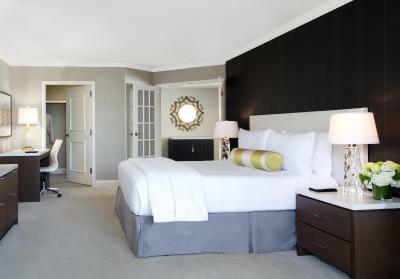 When would you like to stay at InterContinental Los Angeles Century City at Beverly Hills? Separated by french doors, the one-bedroom suite features a private bedroom. The living room features a sofa bed, a chair, a second flat-screen TV, a laptop-compatible safe, a Keurig coffee machine and a mini-bar. A private bathroom with a step-in shower and separate soaking tub is available. Private parking is available on site (reservation is not needed) and costs USD 46.20 per day. Featuring a private terrace, an additional counter space on a granite island is featured in the kitchenette of this suite. A living area with sofa bed, a flat-screen TV, a laptop-compatible safe, a Keurig coffee machine and a mini-bar is offered. The separate bedroom has a second flat-screen cableTV. The elegant private bathrooms (1.5) feature a separate shower and tub. Please note: A roll-away bed will be placed in the room to accommodate a 4th person. This spacious suite features a bedroom and living room separated by 2 French doors. It includes a sofa bed, 2 flat-screen satellite TVs and a private patio or balcony. The private bathroom includes plush bathrobes and free toiletries. Please note: A roll-away bed is available to accommodate the 4th person (for an additional fee). Featuring a furnished corner patio, the room has white linens, a flat-screen TV, a laptop-compatible safe, a Keurig coffee machine and a mini-bar. An elegant private bathroom and a separate tub are available. Featuring a private balcony, this room has a flat-screen TV, a laptop-compatible safe, Keurig coffee machine and a mini-bar. The elegant bathroom features granite surfaces and a separate shower and tub. 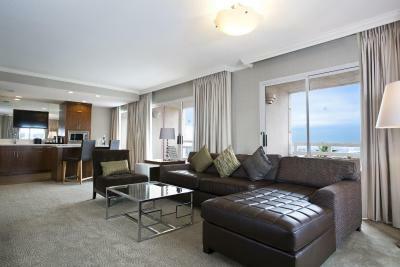 Featuring a private balcony and private bedroom, this one-bedroom suite includes a flat-screen TV. The elegant bathroom features a separate shower and tub. The living area includes amenities like a laptop-compatible safe, a Keurig coffee machine and a mini-bar. Please note: A rollaway bed will be placed in the room to accommodate a 4th person. Featuring a private balcony, this room offers a flat-screen TV and an iPod docking station. A minibar and coffee-making facilities are also included. The elegant bathroom features granite surfaces and separate shower and tub. Offering a private balcony, the elegant private bathroom features granite surfaces and separate shower and tub. A flat-screen cable TV, a laptop-compatible safe, a Keurig coffee machine and a mini-bar. Panoramic city views from a private terrace, an additional counter space on a granite island is featured in the kitchenette of this suite. One of the 1.5 elegant private bathrooms include a separate bathtub tub. Multiple flat-screen TV's are featured throughout the separate living room and bedroom. This air-conditioned disability access suite features a flat-screen satellite TV with pay-per-view channels, an iPod docking station and a work desk. The Studio Suite features a 32-inch flat screen TV and an efficient workstation. The bedroom features a second flat-screen TV. Enjoy your own private balcony with skyline views. Featuring a private balcony, an additional sitting area with lounge chairs, a flat-screen TV and a workstation are available in this studio suite. A second flat-screen TV and a private bathroom with separate shower and tub is featured. A private balcony, a laptop-compatible safe, a Keurig coffee machine and a mini-bar are provided. House Rules InterContinental Los Angeles Century City at Beverly Hills takes special requests – add in the next step! InterContinental Los Angeles Century City at Beverly Hills accepts these cards and reserves the right to temporarily hold an amount prior to arrival. Guests are charged tax per day in addition to the daily private parking charge. There was no side table in both sides of the bed. Not possible to read or have a bottle of water or telephone next to you. There was no side table with light in both sides of the bed. So one person can’t read by the bed. Room 1227. Welcoming staff at the breakfast were a bit rude. The waiters were very nice. When we walked up to our room the door was still being painted and wet for the rest of the day. It is a decent/good hotel, friendly staff. A bit outdated, but comfortable. I got upgraded to a senior suite, which was nice. Amazing property with amazing staff!! Concierge guy was the best!!! The sofa bed was awful! Large room, nice view , staff was extremely friendly and nice ( unexpected I must confess after some reviews I read ). We had a very pleasant stay. The Tesla with a driver that will take you anywhere within 1,5 miles was a very nice touch.